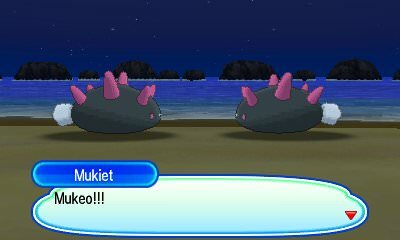 Details: Should you go to Hano Beach at night, you will see a Pyukumuku staring at the sea. A young woman will then come and mention that this Pokemon lost his love when someone was doing a Pyukumuku Chucking Job, saying that you should look for the Pyukumuku's love as she should;'ve swept back up on the shore. After finding the other Pyukumuku and reuniting them, you will receive a Big Pearl. A youngster will then come and throw the female Pyukumuku back into the sea.